Classic Downtown ~ Mono Monday! Growing up in the same city for your whole life means some things become icons, spots that you just know will always be recognizable, no matter how much the rest of the city changes. 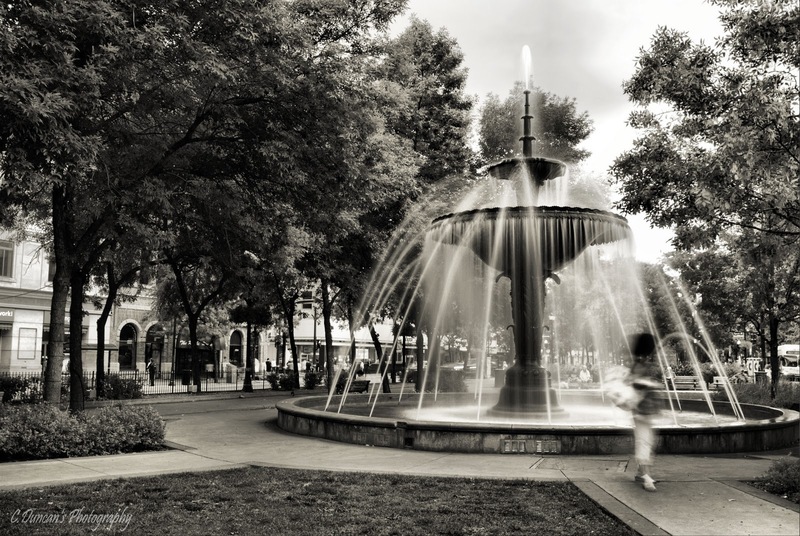 At the very heart of Hamilton's downtown core is Gore Park. It's one of those timeless icons for me. It splits the city's core right down the middle, buildings and businesses jammed up against either side. But in the center, this wonderful fountain, drawing young and old into the park all summer long. Gives you something to look at while trapped in rush hour traffic. It's a bit contrary looking at times. On one hand you have the recently restored historical fountain, the city's pride and joy, and the flower beds and trees surrounding it, giving the illusion of quaint city park space. On the other, just beyond the fountain are the zillions of city bus stops, blaring traffic, and benches with sleeping drunks. Depending on how long you wind up sitting in traffic depends on which part of the view you really see. 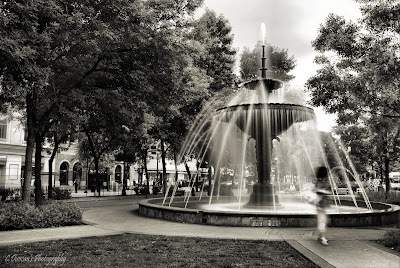 I had to photograph Gore Park for a past job. The image above was the result of frequenting the park over the course of the summer and learning which days were the best to capture the classic nature of the city space. I discovered Sundays late in the afternoon were the best. Folks were out finishing up shopping, letting their kids dip hands in the cool fountain spray, and even seniors sat reading in the shade. Capture it all in Black n' White to boot, and you suddenly have an image that seems, well... timeless. These are the types of scenes I find very easy to capture in black n' white. There are interesting shapes, lots of contrast, and a phenomenal sky is not necessarily a must. For this image, I had my tripod and remote shutter release so that I could use a longer exposure so as to blur and soften the water spouting up in the fountain, as opposed to it's spray looking frozen. The neutral density filter helped keep reflected light and the sky from becoming impossibly bright. Also, a women walking through the park is also in motion off to the right as she leaves the composition, due to this slow exposure. She creates some interest. As I saw this scene I couldn't wait to convert it into a monochromatic image. I can think back to Gore Park when I was young and it was slightly cleaner and less chaotic than now... and it looks exactly like this! Mono images. They can reflect a very classic look to any type of photo. Portraits, landscapes, candids, architecture. Have you tried it yet? Have a great Monday folks, thanks for letting me ramble! 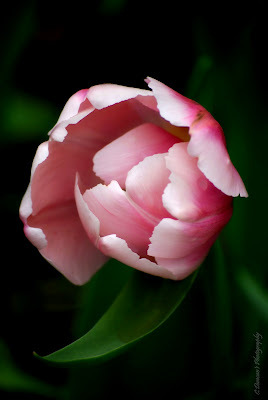 The pinks and greens in this solitary tulip make me think of spring. And it is around the bend, trust me and hang in there. Despite shovelling for the twentieth time this month, despite how you tear up when you see commercials for cruises to tropical islands, and despite the fact your kids have misplaced another glove, making a grand total of eight mismatched pairs, there are still better days coming. I know this to be true cause the tulips are being forced in greenhouses around the world, and being shipped to florists and grocery stores near you. Who needs to leave the comforts of home to photograph nature, especially after such a crazy week? Not me. So we jog up to the store up at the top of the street and buy flowers. Not only does it perk up the whole house, but they make great subjects that don't talk back or need to fix their hair ONE MORE TIME before you press the shutter! Dark fabric or black seamless makes a perfect backdrop, and get your f1.4 prime lens out if you have one. And regardless of lenses, get close and expose for the bloom only. A tiny white piece of card reflects just enough light up into the flower, and done! So, here's a single bloom for all of you saying good riddance to the last week and welcoming a fresh week untouched by daily chaos so far. Also, this tulip is for all those struggling from the recent earthquake in Christchurch, New Zealand to put their lives back together. There is still beauty to be found in the winters of our lives. Such a devastating event puts my week back into perspective, and makes me appreciate all the blessings I have. My prayers go out to them. Thanks for letting me ramble on, have a good one folks! Up and Away ~ Exploration Thursday! Once in a blue moon I catch myself daydreaming. Sometimes I'm craving traveling to distant destinations, often because I've hit on a case of cabin fever. Sometimes I need a change of pace to get motivated, to be creative when everything begins to feel static. Sometimes I peruse all the lenses I could add to my kit, thinking of all the crazy optical options I still need from all the catalogues and sites. Think of the images I could make then! But, it's only daydreaming, because I know great photography doesn't come from the latest glass or gadget or guru. It comes comes from constant learning and never letting something as material as the next new gizmo take the place of your passion. I've known this simple truth since way back in Mr.Shoveller's high school photography class, where he would walk the classroom, orating that the only real tool you needed to hone was "vision" while he waved the broom handle at you that never left his hand while he taught... (on the off chance he'd need to slap it across a sleeping students desk). So for this post, I once again have dug deep into my files, but have only just edited this shot this week. So technically, it's new. I simply let my daydreaming inspire me! This is an image taken in London, England. This particular building with it's retro patterns and walls the color of sky sits tucked in behind the Tate Modern (think modern art and design on regal display) ... and unless you take the most round-about path you can possibly find to the Tate, as I did (story of my life), you'd never see it. For me, I'd always wished I'd a had a more creative, fun lens with me that day. After a while, no matter how cool the buildings are, they can all start looking the same. For ages now I've often thought about fisheye lenses. They give you a sprawling view, but in order for that to happen there's this wonderful circular or spherical distortion to your composition. Alas, money never has grown on trees. And in the interim I've begun to play with similar effects but in my editing program. And suddenly, the sky's the limit! A simple change, but a dramatic one, and now it's got me daydreaming about new possibilities. Thanks for the exploratory ramble folks! Have a good one! 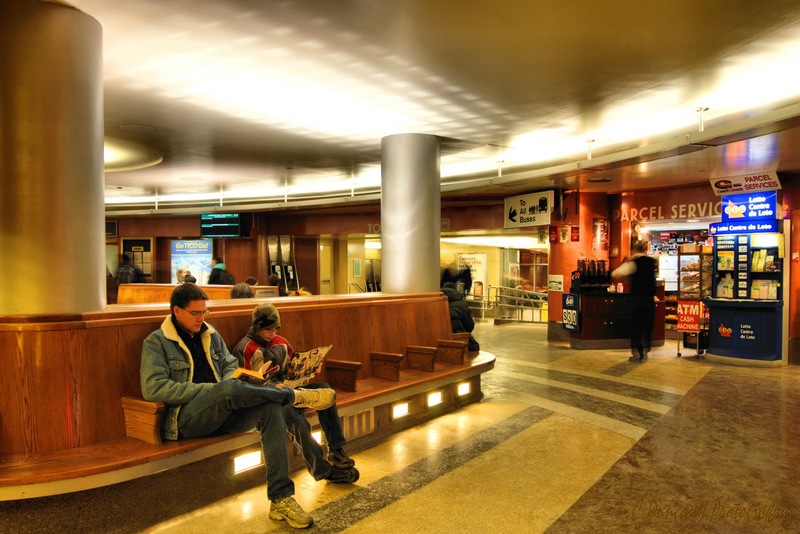 Public Spaces, Familiar Faces ~Wide Angle Wednesday! City life. Inside or out, it gives you endless possibilities to find design, great lighting, and interesting people to photograph. And your wide angle lens is ideal for indoor spaces like this one where you want to include more than just one feature in your photograph. 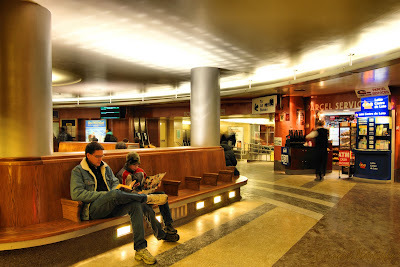 Ordinary people waiting for trains and buses inside the GO Station for example. And when no one will sit still long enough for a long exposure, you can always rely on your family to enter the scene for you. As long as some sort of bribe is involved. For the image above all that the hubby and my son asked for was that I not single them out, let them read in peace, and I was to treat them to burgers n' fries after. Well, I rarely single them out when they're with me on a shoot, and they're so used to me taking my time photographing architecture that they always have a book handy so that was easy. And the burger? I was famished anyways. I normally don't "stage" a scene like this when I'm out, but I felt the composition called for people in the foreground, near the spot where you follow the path through the image to anchor it. I waited for a bit but no one simply "sat" there in that spot, so enter the family. This worked well since I'm trying to get used to directing people more from behind the camera. I'm known for very solitary compositions that show the architecture "untouched" but sometimes you have to include a human presence when you're photographing such a public place. If you look carefully, there are other people in the background in motion, blurs moving through the station due to my longer exposure. When this is intended, motion blur helps tell the story and adds to an otherwise "static" looking scene. Yes, the design of the space is interesting, and the lighting is definitely cool... but without people in the shot, it looks like an empty shell. Not what I wanted the image to say at all. Plus, much to my hubby's chagrin, he's in yet another photo, since he won't just let me take his portrait. Ha. 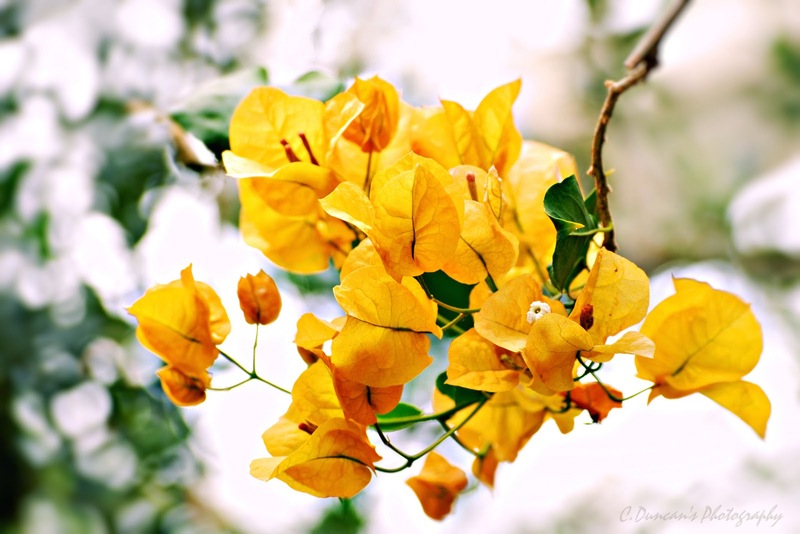 Have you been playing with camera settings yet? Trying slow exposures? Getting any street photography? Thinking compositions and scenes through, then shooting! And don't be afraid of the public. Folks will let you know if they're bothered by you possibly including them in a shot. Stay tuned, in a couple weeks I'm going to address photographing the public for portraits and how to approach people. Meanwhile, I'd love to see the results if this is challenging beginners and hobbyists at all to get out there with me and keep shooting. You can do it! Thanks for letting me ramble on folks! The Best Light ~ Telephoto Tuesday! It's about this particular time of year that I find myself longing to escape. I want to toss aside the bulky winter gear and head somewhere tropical. You too? Every time I look at this scene I feel all warm and toasty, and can almost hear the water lapping the pier. The thing is, for this shot, I hadn't even left home. I took this last August (ahhhh remember warm August nights?) down at the Bayfront Park. A good friend and I had been enjoying the evening, watching Scottish Country dancing on the promenade and I turned and saw the light. Most arguably the best time of the day to photograph is from when the sun begins to set, till about half an hour after... and this is why. Beautiful color abounds. Out of the corner of my eye I spotted a sailboat leaving the harbour for a short jaunt on that calm night, and I started shooting long before she came into the frame so I could fine tune my exposure and have it near ready for when the boat sailed into the shot. The light was changing rapidly, and so I dialed in a faster ISO so my sailboat wouldn't be fuzzy, and kept the shutter speed above 1/100 of a second. 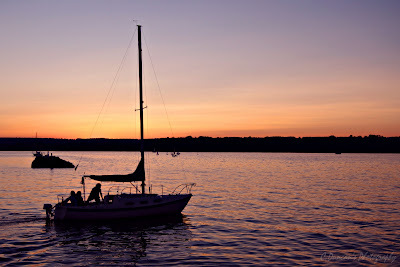 I waited till the sailboat hit the sweet spot within the frame, and got the shot. The other aspect of shooting into the light from the setting sun is that you can get fabulous silhouettes. If you haven't tried this yet, it's a lot of fun. It can be while the sun is sitting above the horizon, or as it's gone down. Meter off the light, not your subject and work quickly since the light will change rapidly once the sun hits the horizon. I had my telephoto in use at the time, and had no time to switch it out, so I kept it on it's widest focal length and composed. In editing I used the color balance tool in the layer adjustment menu to mute the tones that were too blue and dull and she was done. As always, I work in Corel's PaintShop Pro X3 and work from RAW files. So, a little something to brighten the wintry day for me. I hope it did the same for you. And silhouettes can be taken any time of the year... so I guess I have no excuse, I should get out there this week once the sun comes back out and get something more current. Just walked into that one didn't I? Have a good one folks, and thanks for letting me ramble on! "The Man Who Plays the Polka"
Well, here finally is Monday's post! After our internet being down for a few hours and it also being Family Day across Canada, I thought I'd just post one of my first street images from a photowalk about 40 of us did in downtown Hamilton a couple of years ago. I thought I'd let the subject tell you the story behind the image today, as I'm supposed to be devoting time to the family in positive ways, and not by making them scatter as I kick the computer desk several times over in an effort to get the darned thing to work while murmuring under my breath..." one of these days I'm dragging you out to the curb tied to the back of the car and getting the guy next door to TAILGATE!!!" Notice the handle of his accordion made out of duct tape, and the curious expression on his face as he plays from memory some of his childhood favorites. I paid him generously to hear a song, then paid him again to take his picture. He was thrilled. 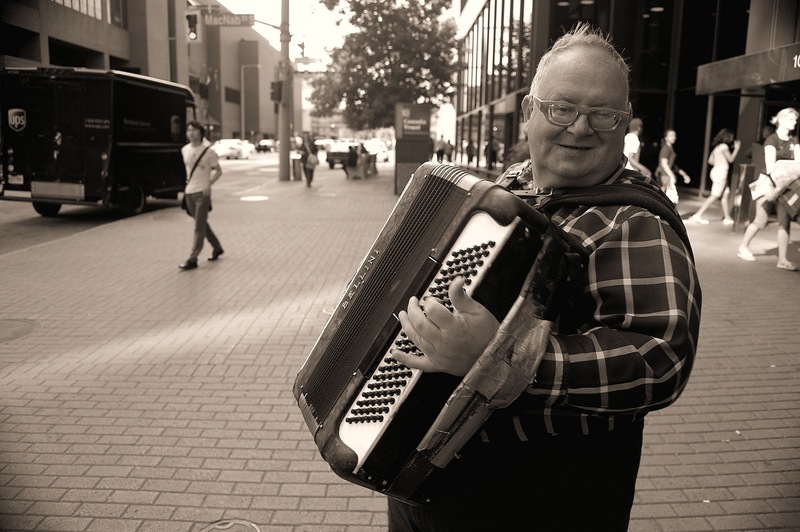 You can find him at any given day in the downtown core, playing polkas and taking handouts. The rest of his story is up to you today! Thanks for letting me give a short ramble, will be back in full swing for tomorrow! Happy Family Day! Happy Floral Friday one and all! This will be a quick post for me today, the sun is out and the temp has risen above 0 degrees here in Ontario. Naturally, this means I'm heading out with the Nikon! Today's image was taken at the Tropical Greenhouse at the Royal Botanical Gardens. The ceiling and displays have these trailing bits of sunshine climbing everywhere inside. Like the greenhouse was sun kissed everywhere you look. Bathed in light. Ahhhh. It lifts the spirits and assures that spring is wanting to arrive soon! Just the color yellow will do that, no matter where it is. It energizes and inspires. A quick tip. Be careful when photographing at the local greenhouse. 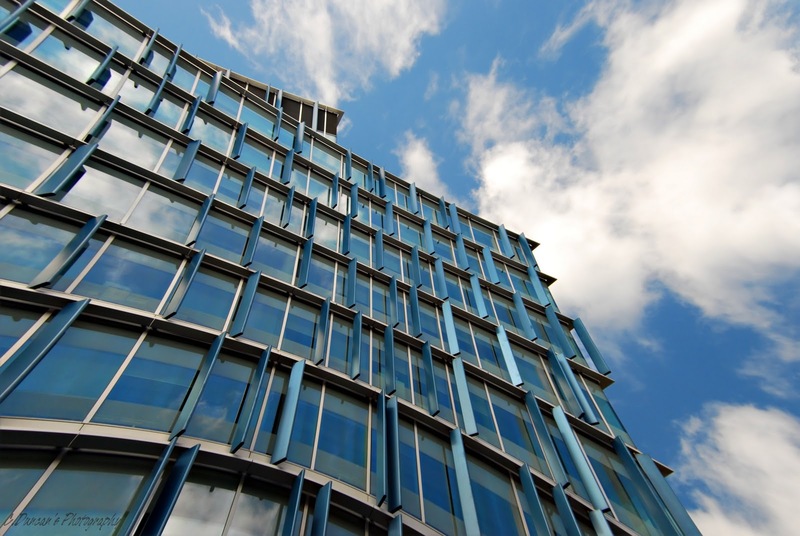 If the sun is out, all that glass will make it difficult at time to get killer shots. Everything starts to get washed out, and metering for a more even exposure can drive you mad, highlights either go off the grid, of the shadows from underexposing swallow up select areas. I know for this image, even though it was overcast, all the light coming into the greenhouse was messing with an overall metering of the composition I had decided on. So I made the decision to use a more selective type of metering in my dial/menu options, so that my meter actually metered more from my subject which was essential for the shot than the rest of the area in the frame. When I checked my histogram (the graph feature on your camera for where your lights and darks are balanced in the exposure) I realized the overexposed highlights were allowable this time since they were essentially the backdrop, and not the flowers themselves. Instead of this looking like a poorly made decision, it now looked high key and so I kept the reading and made the shot. Also, this meant I had to take into consideration the lens I was using. It was my telephoto, which compresses the shot from foreground to background, so even at F/7.1 it had a considerably shallow depth of field where the light and plants in the background blurred out nicely. If I had stopped down to much more narrow aperture of F/11, and adjusted my shutter speed, the blown highlights would have then been a problem again since you'd be seeing a very definitive overexposure problem. All this was of course shot manually. Auto modes can be handy for shooting quickly in certain situations, but in a semi-auto mode the camera would have tried to correct everything, giving me a very mundane, dull image. In manual mode, I chose every setting myself, and could manipulate which things were more important for me, and get creative with the rest. This is key. Take the plunge all you DSLR owners with your settings on auto. Start learning how to expose. It opens the floodgates of creativity... and allows the sun to shine in. Have a fab Friday all, and thanks for letting me ramble on! See you all Monday! Something New ~ Exploration Thursday! I do believe this is the first time you will have seen this type of photo from me here at the blog. A portrait. The act of posting this means I have no trouble being transparent with you all. For the fact of the matter is this: portraits stress me out. Big time. I'm in awe every time I meet a full time portrait photographer because they balance their understanding of human beauty and emotion with art. If they're really good at what they do, it captivates. But for me, it is probably my weakest area, so every once in a while I decide to play with whatever light there is and a family member/volunteer. And I explore and pinpoint what I have trouble with so that it's not a wasted skill. This portrait of my daughter was taken in preparation for an exercise in available light. This means I didn't use a flash, and did not set up strobes or studio gear of any kind. Just the light coming through the window. 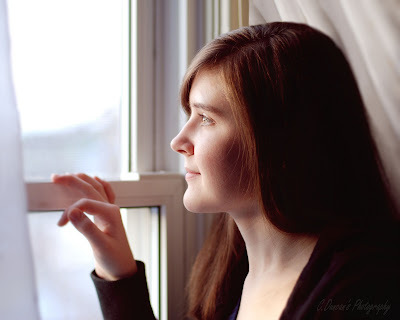 I played with distances from the window, my Depth of Field, and different parts of the scene to meter from. I am also trying to finesse how to direct the model better. If I were totally honest, I'm so used to sizing up ready compositions before me in architecture or city scenes and landscapes, that I forget to slow down and really direct the model. I need to work on this. And the results are getting better as I go along. This was taken with one of my favorite lenses in my kit. In fact, there's only three that stay in my kit at all times, my 18-55mm wide angle zoom, my 55-200mm telephoto zoom, and this lens used here, the 50mm prime lens (or fixed lens). No fancy zoom feature, very little perspective distortion, and a very fast piece of glass at F/1.4 which allows for low light, very soft, handheld portraits. I've been known to use it though on everything. This was one of the first results, and although most people would show you the finished shot or the best, I thought I'd save that for later. Because a good photographer doesn't just rush ahead, a good photographer also studies the results that needs some improvement. Mistakes are never a bad thing, you study them so you know what NOT to do next time. And next time I know I would shoot on the vertical, fill some of the darker areas of her hair and face with some reflected light bounced back into the shot, and get the model to tilt her head slightly to the right, like she's really looking for something, or someone. Lot's of possibilities, lots of things I know I need to consider for the final shot. I'll let you know how it goes. And there are things I do like about this one, don't get me wrong. Her placement of the hand on the sill, the overexposure washing out everything but her so that she's the focus, and a tight framing so that nothing else in the room distracted. There you have it. Never be afraid to conquer something new or intimidating.Yes, there's a possibility that you'll fail. But with that possible fail comes an opportunity to grow. Sounds idealistic? Maybe, but it's working for my photography. How about you? Taken on any huge challenges lately and been surprised at how well you adapted? Shows you aren't afraid to learn. And that's exciting. A special thanks to my beautiful daughter who has a light all her own that shines! Thanks for being up for a spur of the moment shoot to help your crazy photog mom! And...Thanks for letting me ramble on, and have a terrific Thursday folks! Trees. No matter the time of year, no matter what the weather, trees fascinate me. Their different forms, heights, colors, fruits, roots, and textures... always make for an interesting study. Gnarly old trunks, autumn displays of color, tangles of winter branches, not to mention the critters that dwell in them. 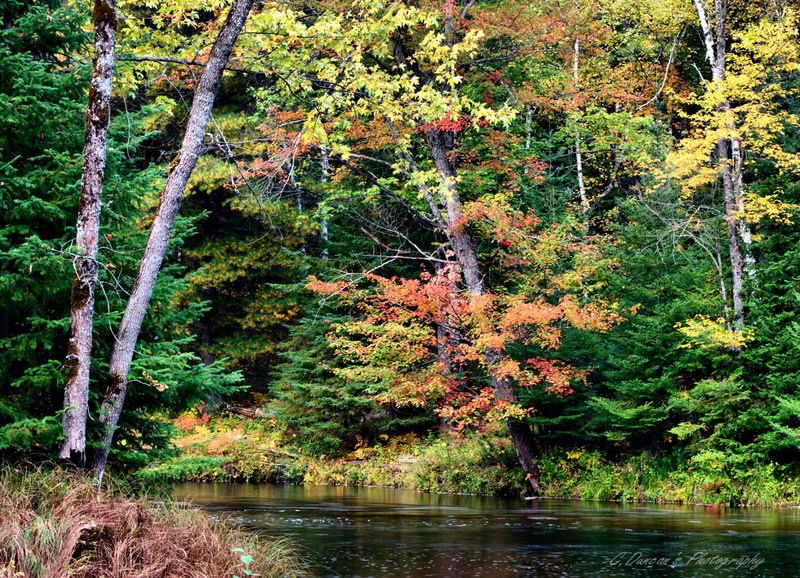 It all provides a canvas for the nature lover with a camera. Trees photographed well need no other subject matter, they can be majestic, and mysterious. Frilly and flowery. Towering and powerful. You know exactly what I mean, don't you? My week is running away with me a bit, and I've yet to get outside with the camera. So I thought I'd post an image from my autumn road trip that I've only just edited in the last twenty four hours. Even though this is not the sprawling spacious landscape we often associate with wide angle lenses, this was taken at a 55mm focal length, and allows for room to set up a complex composition so as to fully accentuate the grouping of trees in full fall color. The sky was rather dull and grey, a thick wall of cloud with zero definition. So I framed just the trees, and composed a bit downstream so as to create a way to break up the different layers of shrubs and trees with the creek flowing into the shot. The tree in the left side foreground area has some natural angles to it, and the bark stood out against the dark greens behind. The background trees lean in on the opposite angle to it and have hits of saturated color due to a mild rain shower. Hence the spots and bubbles in the current of the creek. Where I knelt along the bank for this shot, my husband and I were under a thick canopy that sheltered us from the rain. It was tranquil, soothing, rustic. I hope you see all of that when you look at the above image! If I have any one tip today for using a wide angle lens, I guess it'd be don't be afraid to tighten up your composition. All too often I see photos where it looks like everything was miles away, and it's the first thing I hear from beginners, that their images look so distant. That they thought they were much closer at the time. Start getting closer to your scenery! And it's been said over and over in reference to photography: if you think you're plenty close, get closer still. I begin fairly close, and keep working my way deeper and deeper into the shot. It's provided me with some unexpected results when I first started, and now it's second nature. And speaking of wonderful landscapes, I'm delighted to add an image to my blog today from my good friend and extraordinary photographer Bob Grauer. Bob has been one of the few photographers who keeps me on the straight and narrow road of photographic quality. I have learned a great deal from him about everything from great light and composition, to what bit depth to use at the printer! He's never afraid to tell it like it is, and for that I've been extremely grateful. So I'm pleased to share one of my favorite images of his here today! Not only do I love how Bob saw the foggy morning winter light creating a mysterious backdrop for these clusters of Bald Cypress (which I'm told look like this year round) but his choice of wide angle lens allowed him to accentuate the boardwalk and lead us into the image. Very engaging, and so effective. It transports you. Thanks for allowing me to share this beautiful photo Bob! And thanks to everyone for allowing me to ramble on! Inspired yet to get out there with your own camera? I hope so! Have a good one folks! Colorful Reflections ~ Telephoto Tuesday! 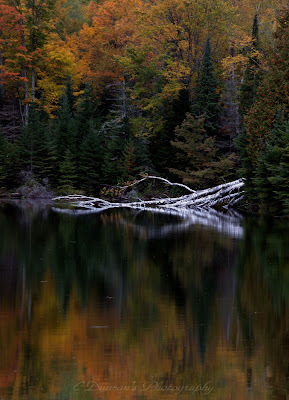 "Birch on Big Yurkie Lake"
Last week I did a post about a reflection at an intersection, this week I thought I'd post about a natural reflection I photographed not that long ago, up near the Madawaskas area this past fall. I'll come right out and say... this is not a pristine image, it's not technically flawless by any means, but I love it for it's symmetry, colors, and the memories it brings back of that road trip. Well, some of them, as I ended up being sick as a dog this particular day. But I couldn't let that stop me, I had one chance to photograph this beautiful lake. We were photographing all day, all the way home starting from the Ottawa Valley... a 6 hour drive I managed to lengthen to 11. And Big Yurkie Lake was on the way. It was a goal of mine to spend quite some time there, it's only entrance a jog at the side of the rural highway. Then you walked in. And you didn't know where to start pointing your camera! I had my sights set on Big Yurkie because two years before I had gotten some quick shots of it while on the road with my family, but quick shots were all they were and I regretted not taking more time. You're forced to walk along the very narrow shoreline the entire time, and I hadn't used a tripod. And Big Yurkie always seems to be overcast, with dark, dark shores across the water, not a soul in sight, and usually within a half an hour it begins to lightly rain. Makes for a very mysterious spot. This shot is from the opposite side of the lake, far enough away that I had to stand on an outcropping as far as I could safely go with my camera and tripod, and zoom in to the fullest focal length my telephoto lens would give me, 200mm. I turned off the lens' Vibration Reduction mode since I was using the tripod and remote shutter release, as this causes the lens to fight against the anchoring a tripod gives. There was such a dark sky that I used a long exposure to get enough light and the tripod was a must. Because of a slight breeze on the water, the trees are slightly blurred, giving a soft effect that I would have preferred more crisp at the time, but have come to terms with now. And the one thing that stood out, helping to divide the composition where reflections and nature met was a floating remnant of birch tree. Shortly after this shot, true to form, it began a light rain, and so we went back to the car as I didn't need to be more sick than I already was. But I was happy... I'd caught a true representation of the moody Big Yurkie, beautiful and untouched. And that's what mattered. I excited to share another image with you all today... this one comes from a good friend and someone I consider a mentor. 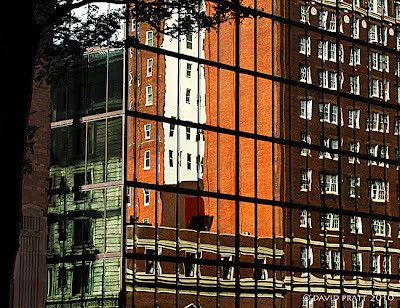 After the post last week of the city reflection, he sent me his own reflection taken with a telephoto, in Boston and it's another perfect example of seeing a select composition within the enormity of the city. I particularly like the warm brick reflected back in the scene, the great contrasting lines, and the bit of tree coming into the frame adding to the perspective. Brilliant. Thanks Dave Pratt for allowing me to post your wonderful image, and if any else has been following the different themes throughout the week and you'd like to send me your photograph to add to my next blog, give me a shout in the comments below and I will send you my email address pronto! Thanks for letting me ramble on folks, and have a fabulous day! 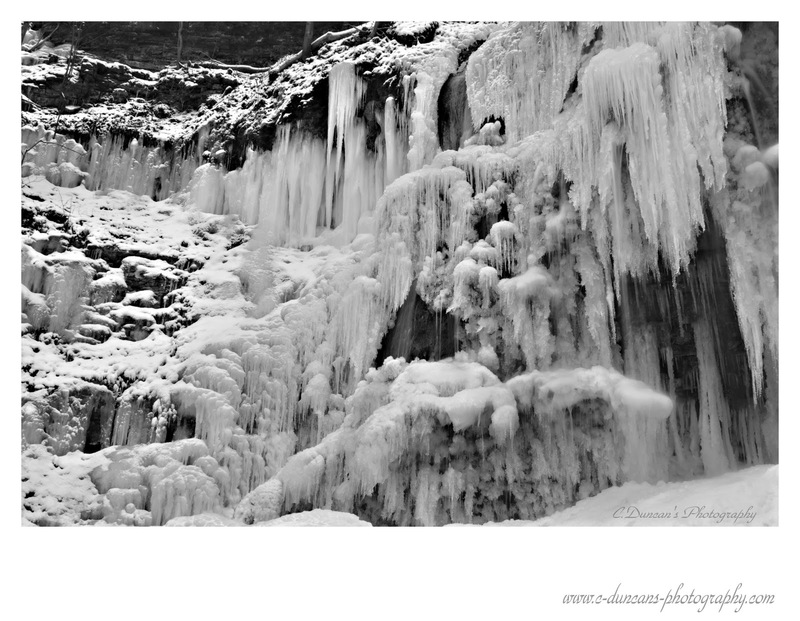 Contrast in Nature ~ Mono Monday! This Mono Monday I decided to go with a landscape. Actually, a landscape taken in the midst of the city along the Niagara Escarpment, overlooking Hamilton, Ontario. This is Sam Lawrence Park, one of the best maintained and most beautiful perennial gardens in the area. It's layered with varieties of plants and trees that all compliment one another throughout different parts of the year. I have files upon files of this park, I never get tired of photographing it! It's a welcome contrast to much of the rest of the smoggy, chaotic city scene. This particular landscape was chosen to become the Black and White version above because I was drawn to the heavy contrast throughout the scene. The light chisels out the edge of this part of the escarpment, diagonally across the composition, emphasizing the rock face along the path. 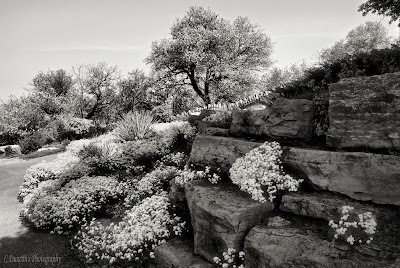 And the bright clusters of early flowers contrast against the shaded rocks, spilling over and under and around, paying no attention to the harsh light about to creep across the trail. All this contrasting shadow and light, it's hard to meter for, to make sure you take a reading off a very neutral area of stone or greenery so that your highlights don't blow out, but you also don't loose details in the shadows. Your exposure needs the right mixture of both. The other reason I knew this would work as a monochromatic image was because of all the textures that make up the scene. Also, there's layers within the composition, from the low foreground elements, all the way back into the background with trees adding height, something I always look for in a landscape of any kind. Keeps the image from being one dimensional. Even though it's in B and W, it still needs to come to life when others look at it. That's the danger of a Black and White image, that it becomes a flat representation of what we see in the lens. Keeping that in mind as I edited this image I actually used a different B and W filter on two separate layers of the same shot. The one filter is a Platinum fx filter which is great for defining dark areas when converting to B and W. The other layer was edited with an Infra Red filter which gives a glow and stark contrast to all the highlights. Layering the IR layer subtly into the Platinum layer gave me a very dynamic B and W, full of life. I knew I had to share this image for today. And I hope you approve. Don't be afraid to be creative, even in B and W. Especially in landscapes! Use contrasting elements to your advantage. Challenge yourself to see without color! As always, thanks for letting me ramble on! Have a super awesome Monday folks! And Happy Valentine's Day as well! 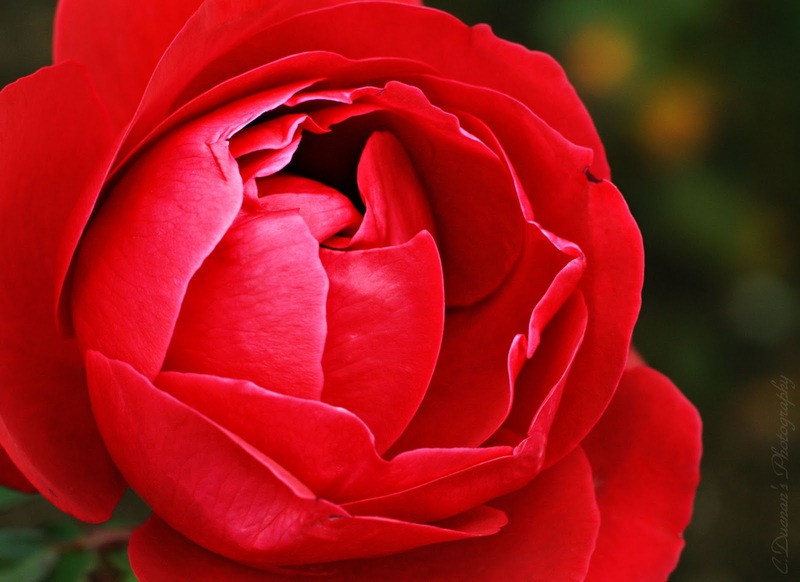 Sweetheart Rose ~ Floral Friday! Valentine's Day is quickly approaching, so I thought today would be a fabulous day to post such a sweet, delicate pink climber as the image for Friday's theme. Thinking about a sweetheart this weekend? Missing someone perhaps? Secret crushes out there? Then this one's for you! I had no intention of photographing tiny delicate roses the day I took this image. I was out setting up the right roadside location to photograph gardening and landscape crews for a job. It was extremely warm for late May, you broke a sweat just thinking about planting hundreds of annuals at the side of a lengthy road. I had to keep my gear in any shade I could find, and I had to work fast so that the city crews could work unhindered for the rest of the morning before it got any warmer. They were very kind to me just the same, allowed me to get in the way, then I hightailed it outta there! Just as I went to get back in the car I saw it. 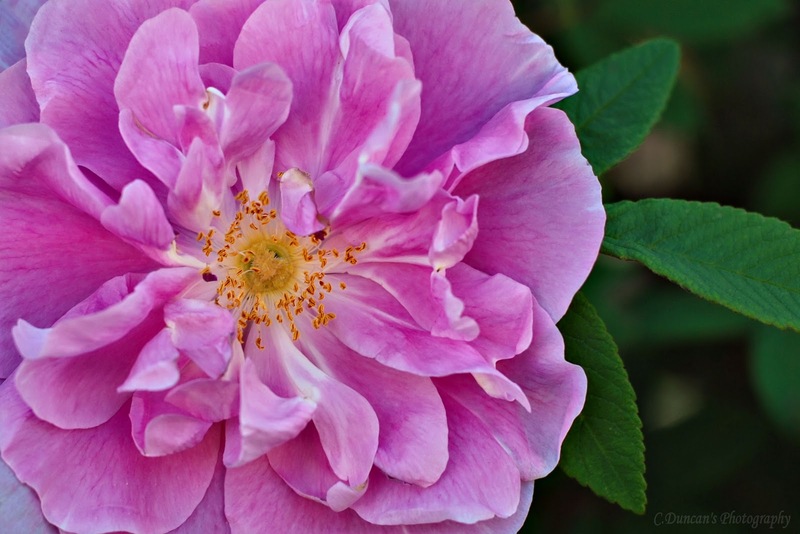 One solitary rose, a climber beginning to sprawl along a fence under a group of shady trees. It was the only bud and in full bloom! It was love at first sight. Perhaps the sun at some point saturated that spot with light, causing it's early growth spurt despite the heavy shade it currently sat in. But the effect was enchanting, since it was the only one to see, and it's sweet scent only noticeable if you leaned right in against it. Sure, an entire bush would have been a lovely sight as well. But because it was the only one, timidly residing in the shade, it made it seem rapturously beautiful and enchanting. I had to preserve it in the lens. This was taken with what is normally a portrait lens. The Nikkor F/1.4 50mm prime gives soft focus, lovely bokeh, and will enhance selected details in very low light if needed, and quickly. Handheld shots are a pleasure with this lens. And I love using it on nature instead of people. Flowers become characters getting their close-ups, dreamy soft portraits with intense selective detail to show off their best angles. I fall in love with the process of photographing all over again every time I use this approach to a floral image. I hope you can see why! Take the time to stop this weekend and think about why you really love your sweetheart in prep for Valentine's Day. Like capturing the single rose, when you spend time with a loved one, deliberately removing all the distractions, their full beauty is revealed for you to fully appreciate what it is that always draws you to them in the first place. Thanks for letting me ramble on, and please come and check out my special Valentine's Day Contest Draw for a free print when you add your "like" to my Facebook page here . Under the Contest Post Image, leave the name of the person you love in the comments section and on Monday Feb.14th your name could be selected in the draw for a free 11x14 size matted original limited edition print, signed and numbered. You will be contacted by FB message if you win! So have a wonderful Valentine's Day everyone! See you Monday! Leafy Impressionism ~ Exploration Thursdays! Welcome to Exploration Thursdays! This will be the one day of the week I can let my hair down and explore the more creative sides of photography. There will be anything from playing with slow exposures and playing right in the camera, to experimenting in the digital darkroom, to having guest bloggers and new tips for you all to be trying at home! Sound good? Cool. So let's have our first fun Thursday! My first image featured for these Thursdays is a personal fave, and I don't think I've really had a chance to showcase it yet... I'm considering having it printed on canvas actually. I took this while scouting for photo ops for my Parks job this past fall. The light that day was very bland, but it was great for macro/close-up type shots of the flora and fauna just flourishing in the beds. 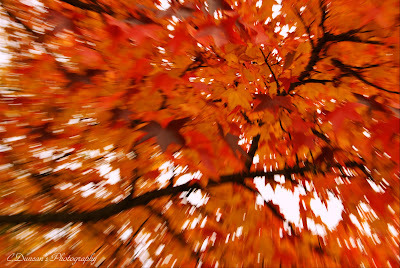 But you know me, I HAVE to look up too... and I happened to be standing under a blazing Maple Tree. It's leaves were barely moving in the whisper of a breeze but I could tell one good stiff wind, and down they'd come. It doesn't matter how old you are, falling leaves evoke days of jumping in crunchy piles being raked, and pressing the biggest most colorful ones into crafts or into big books for safe keeping. Looking up into the giant canopy, I decided I needed to portray how I felt, and not just how all the leaves "looked". I also knew to do that, that I needed to think outside the box on this one. One of my favorite Canadian nature photographers is Freeman Patterson (I know, I've mentioned him before) because he sees nature as something to explore emotionally once he understands the intricate ways it grows and lives. His images convey energy, motion, and poetry. And I think his in-camera manipulations are some of the most beautiful and inspirational I've ever seen. So I looked up into the tree and thought, "now how would Mr. Patterson approach this?" accentuate length or height, to emulate something speeding by, or something rushing towards you as I did above. Then do it several times, changing your speeds, your views, and your lighting. I used my tripod and remote shutter release for this shot, simply because I wanted my hands free to carefully zoom up into the leaves overhead with my kit lens without the camera wobbling. And it took a few tries before I realized where I liked seeing the branch peeking through the composition a bit, as well as one or two more discernible leaf shapes in the mix to hint at the subject. All that was left to do with the shot when I got home was improve the saturation levels a bit more so the color was bolder and that was it. I now officially have a "theme" for every day of the week! I'm excited to see if I can find ways to challenge myself every week... and I'd love if you folks out there wanted to practice each different theme with me! Send me links to your best results and I'll post them here! Let's inspire and motivate each other! Thanks for letting me ramble on about all this, and make sure you all have a fabulous day! See you tomorrow for another "Floral Friday". As mentioned yesterday, I'm using themes for the next while in order to keep myself motivated and challenged as a photographer. Wednesday's will be dedicated to wide angle shots. Some days I'll use ultra wide lenses, others just a standard wide angle. I'm starting off though with what all manufacturer's call the "kit lens". This is a moderate, all purpose zoom, it's widest view at an 18mm focal length, it's tightest at a 55mm focal length. It's great for anything from landscapes, to architecture, to candids. It's the lens they usually throw in with your first DSLR purchase. And I never leave the house without it. I spent part of the day yesterday wandering our newly renovated Farmer's Market downtown. Those of you who know me well know I took one look at the design elements and construction of the space and totally forgot all about actually photographing farmers and their wares. 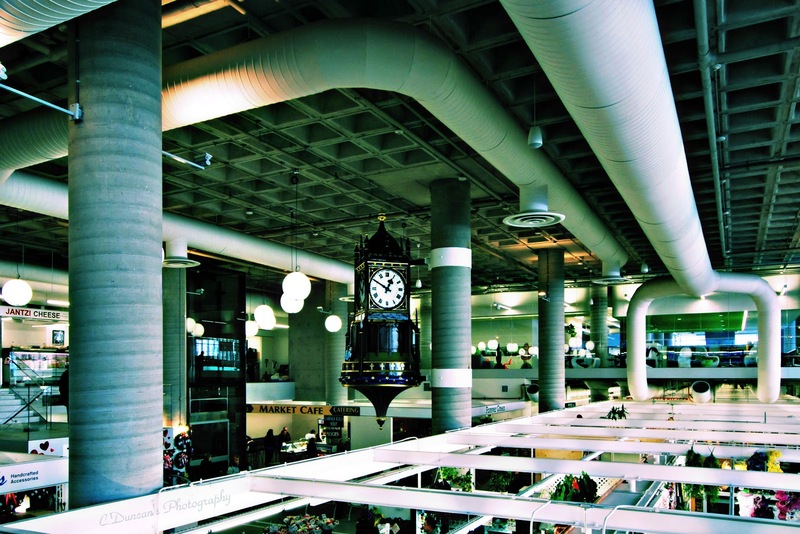 You enter at the top level of the market overlooking the entire space and see all the duct work, piping, and support elements... and it's pretty cool looking! Not to mention the ceiling being peppered with glass spherical lighting and the original Jackson Square Clock residing now indoors after being restored to it's original glory and safe from vandals. Obviously I wanted to emphasize all the converging lines and shapes, showing the height and the angles that spread through the space. So my choice was naturally my wide angle lens. Because I was indoors and without the tripod (which would have been in the way since the aisles are tight and very busy with shoppers) I had to bump my ISO to 500, which adds a bit of noise but allowed my camera to get the shot without any shake on my part. I was still able to rest my arm on the railing for a sturdy position. There was northerly side light from a big bank of windows providing enough light throughout the space. I have corrected any lens distortion in PSPx3, and at 18mm there was some slight curving to the column on the left specifically. I also decided to work in a cross processed color filter effect layered over a darker B&W version to really draw attention to the designs and lines along through the composition without being over saturated. Very industrial looking as a result, and exactly what drew me to the scene in the first place! This was a fun edit for me, and once again, I KNEW this shot was one I would love to work on the second I took it. With my average kit lens, at it's widest focal length. Don't let anyone tell you that you have to have a thousand lenses. Learn first to excel with the ones you have! My high school photography teacher taught me that way back in my film camera days, and I've never forgotten it! I think he'd enjoy wide angle Wednesdays too. Thanks for letting me ramble on for today folks! Have an awesome day... can't wait to show you what's on tap for Thursdays! 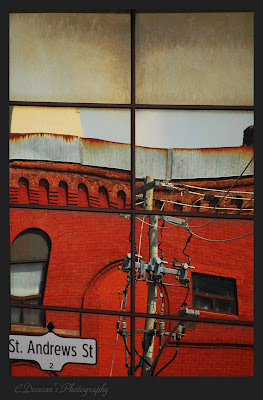 Accidental Reflection ~ Telephoto Tuesday! 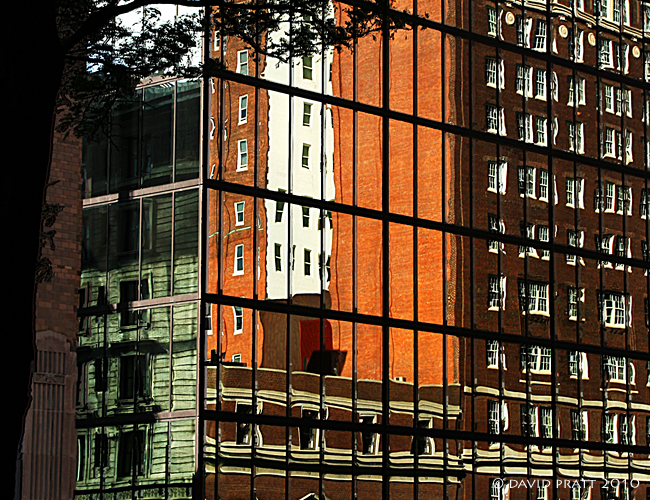 "Reflections of St. Andrews St"
My first "Telephoto Tuesday"! I've decided for the next while to use themes here at the blog. Just to challenge myself, with my shooting, and my blogging. This way I'm not stuck in a rut at some point always using the same lens or the same style of photography. It keeps the creative juices flowing. When I first started in digital photography, it did not take me long before I fell in love with my telephoto lens. It's a Nikkor 55-200 mm zoom with an adequate range, adequate F-stop and the much needed VR (vibration reduction) feature in case you're handholding with this heavier type lens. But the technical is not what drew me... it was the ability to get in tight on any subject. I love to take one key element, and make it the entire image. My tele zoom does exactly that. And that makes me a very happy photographer! I chose the image above to kick off this Tuesday's post because it epitomizes why I will always keep my telephoto lenses close. REALLY close, as in sitting ready in my front pocket of my kit bag or jacket, right next to my elbow close. This image is the reflection of an abandoned red brick building in downtown Toronto, and the street sign in front of it in a warped window front. I had my trusty little Nikon D40 with me at the time, and we had just left a tour of Castle Loma. I always like to keep my camera in my lap when driving through the city, even when I think I'm done for the day. And it's a good thing I did, because there we were sitting at an intersection waiting for the green light and I turned to look out my window. Voila! I was met with an entire warped windowed wall of an old storefront across the street from me, and it was reflecting this bold red in it's framed sections. I leaned out the window and snapped this shot right before the lights turned green and my husband pulled away. No time for settings, dials, or adjusting the shutter speed... just zoomed in to crop a section with the most interesting part of the reflection, and then we were gone. This was the first image I rushed home to see. Never mind the glorious castle I had spent all day shooting... I knew this was the shot of the day. It's funky, bold, and abstract, yet for me, still smacks of the everyday ordinary city living. This is what photography should do for you! It should excite you, it should grab you, it should bring unique details to life. A telephoto point of view can do that... it'll eliminate all the clutter, give you a bit of "tunnel vision" if you will, and make you stop and really look at what's around you. There's some cool stuff out there... even at the crowded intersection downtown. I look forward to bringing you a new telephoto shot every Tuesday, keeping my eye trained to look for opportunities like this every week. I'd love if some of you did it with me... and if you have a shot you're particularly proud of as a result, I could ask you to let me arrange to post it here, and we can ask you how you did it too! You never know! 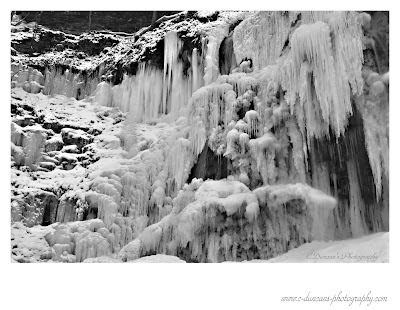 Icy Formations ~ Mono Monday! I'd like to make a confession here on Mono Monday. Some will shake their heads when they read this, some will understand completely. But I feel I must be honest. So here goes. I have lived in Canada my whole life. It's February. It's winter. And (taking a deep breath here...) I don't like it. Ah, there, I said it!!!! I know that out there in all the snow and ice are great photo ops but it requires putting on a thousand layers of clothing, tucking gear and batteries safely and warmly in any available crevice in said clothing, and wandering treacherous and slippery paths and locations with a tripod in one hand and a Timmie's coffee in the other. Often it's while my family tags along under the guise of sledding or only being out walking "for a sec". Ha, could only pull that one on them a handful of times before they got wise to me and started "disappearing" every time I suddenly hunted for snow pants in the back of the house. Let's be honest, I'd much rather be out in the warmer weather, catching the tulip festival at the park, or driving back roads with the windows down and the tunes cranked looking for barns and farm gear to shoot. But having said all this, there is something to be said for winter photography. Despite all the extra work before I even get out to the car, despite the fact that every year pulling on the monster boots seems to wind me more and more, and despite the way my hubby looks at me when he realizes I need a walking buddy in -23 weather without the wind chill... despite all that, there's a treasure to be gleaned every time I head out to shoot. And it's this: YOU LEARN TO WORK FAST! Shooting outdoors in the chilly Canadian weather (and yes, I'm aware there's chillier, don't get me wrong) forces you to work fast. Sum up a scene quickly, decide what's important to portray, to emphasize, and what to eliminate. Your composure skills are naturally honed when you know that the cold is eating at your battery, that your tripod adjust knobs are freezing in place, and that you've stopped feeling your feet. Your brain goes into adrenaline mode when you can hear your husbands teeth chattering from twenty feet away and you've only been on the trail for ten minutes. You realize you need to get those other angles NOW since once you get back in the car there's no way you're getting back out for that one forgotten shot. And you learn to think quickly about all the tools at your disposal. Filters are at the ready for the slow exposures of the trickling water still running through the icy rock face, the tripod doesn't leave your side, and your other lens is already waiting in your pocket for a very quick switch indeed while you have a plastic bag waiting for the other lens to defog in once your finished. And your settings! You learn to sum up the light real quick and no foolin' around in your menus, cause no matter how warm those gloves are, they're a pain to use when you have to push tiny buttons right? See what I mean about working well but working quickly? So all kidding aside... if you visit the cooler climates that require sled dogs and snow shoes, or simply live where you've shoveled another eight feet of snow out of your driveway for the fourth time (shovelers unite!) then make yourself get out there with the camera, give yourself twenty minutes to an hour to photograph, then go home to some winter stew and warm pj's and review how you did. You'll get a very clear picture of what you still need to remember, and what you excel at under pressure. And how a frozen finger looks after you pry it off the shutter too fast...ouch. Have a good Monday folks... and thanks for letting me ramble on! Tomorrow is our first Telephoto Tuesday! Hope to see ya then! It's Friday! Floral is our theme again, and today I've posted one of my absolute favorite images from the past summer. Maybe because Valentine's Day is a week away (guys...tryin' to help you out here) and more likely because here in Hammertown we're still swamped with snow, but the deep dramatic color and velvet shape of the petals just seemed to be my next logical image choice for you all to enjoy. Not entirely sure where my exposure data went to on this file but I had to dig way back into original RAW files before I could see how I shot this one. For all you photogers out there that crave info here we go: 1/200sec @ F/5, ISO 125, 50mm fl, 50mm Nikkor Prime lens, overcast morning light, tripod, remote shutter release, reflector, pattern metering. I find red a difficult flower color to capture sometimes, it's extremely saturated on it's own. Detail in the petals can disappear if you're not careful with deep reds, but on overcast days I can underexpose slightly to get an accurate color, then change the levels slightly in Corel later to ensure the image isn't actually too dark overall. One of the best places to practice photographing deep or bold color in flower beds is over at the Royal Botanical Gardens. Indoors or out, it's a nature photographer's paradise. It's the largest garden of it's kind in all of Canada, situated between Hamilton and Burlington, Ontario. 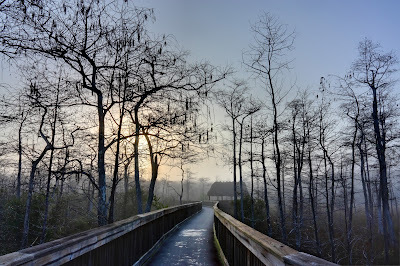 And the most eclectic of it's kind, from the world's largest natural lilac dell, or tens of thousands of tulips in the rock gardens, to it's wide naturalized areas with marshland and wildlife, not to mention the trails you can walk. And the greenhouses are always displaying the unusual. It's also a National Historic Site. What's not to love? And it's full of intense color. I've spent many a day wandering the grounds in all seasons. In particular, this image was taken out in the Hendrie Park gardens, where they have thousands of roses through the summer months along with live jazz music and various events. So.... how many months till the warm weather returns? Think I'll go over to the flower shop at the top of the street and get a handful of roses for my studio/dining room and immerse myself in a bit of summer in February. With the camera. Of course.